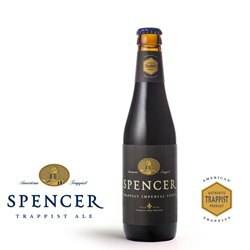 Spencer Trappist Imperial Stout (ABV 8.7%) is a massive, roasted, malt-forward American Trappist take on the Anglo-Russo Imperial Stout tradition. Luxuriantly frothy foam, waves of coffee, chocolate and caramel sensations, a generous blend of dark fruit flavors. Intense and robust. 11.2 oz. bottle. May 7, 2018 | By Paul F.